As we all know, attacks on the Clean Air Act are coming from all sides -- and Rep. Fred Upton, chairman of the House Energy and Commerce Committee, is leading the charge. Big Polluters are backing up the charge with a whirring PR machine, lobbying dollars, and the promise of more campaign dollars to come. In fact, the messaging coming from corporate polluters and their allies in Congress, who are concerned about their campaign dollars, is nearly identical. What's a concerned climate activist to do? Why, join the fight of course! The only thing more powerful than the polluter lobby is the voices of scores of climate activists at rallies and congressional offices across the country over February recess. In two weeks, climate teams from Miami to Boulder will be holding 'Protect the Clean Air Act' rallies to call on their elected officials to publicly stand strong in supporting the Clean Air Act. 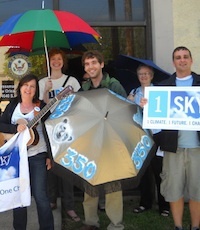 Visit the 1Sky Climate Network page to find one near you. If you don't see one, don't worry -- check back again soon because we're adding events all the time! Folks who are not near a climate team are planning meetings with their congressional offices to talk about protecting the Clean Air Act, and many activists are going it solo and just dropping in to make their voices heard. Can you join us? Find a climate rally or meeting near you, or just customize a letter to your representative and drop in to their office! Votes speak louder than lobbyist dollars, so make your voice heard. Email us if you are not sure where to start, or just sign up and we will contact you!